Look, it's the improved version of that armor from Iron Man 2! 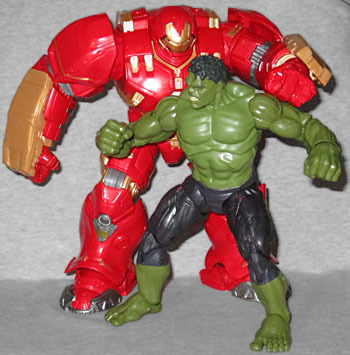 The Hulkbuster armor was introduced to the comics after Joss Whedon had stopped reading them, but it's so iconic, it just had to be included in the movie! 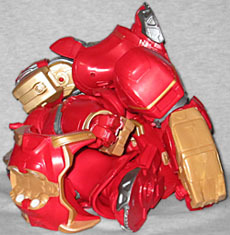 The Hulkbuster armor is the Build-A-Figure for Avengers 2: Feline Groovy Series 2, just as Thanos was the BAF for Series 1. It's sold as eight separate pieces: legs, arms, head, trunk, and the front and back of the torso. Buy all the Series 2 figures, click the pieces together, and you've got a giant figure. And unlike a lot of recent BAF series, this time you won't end up with any duplicate pieces! Nice change, Hasbro. 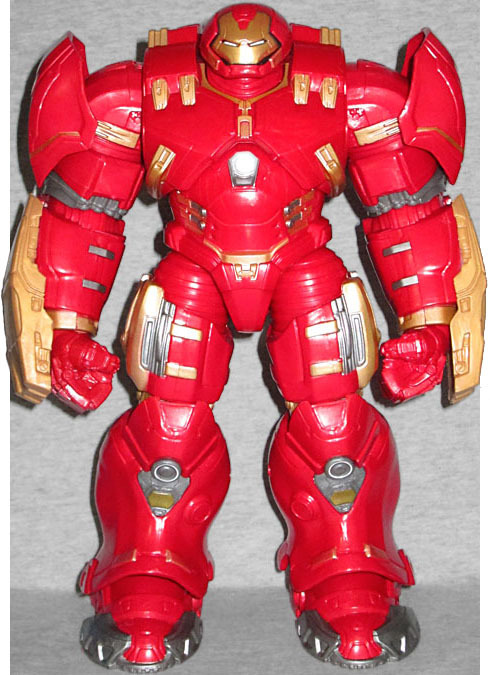 In-universe, Hulkbuster is known as the "Mark 44" armor, and rather than being a standalone suit, it does what its comic forebear did: wraps around the armor Tony was already wearing. 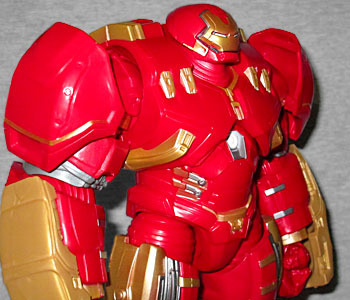 According to official sources, the Hulkbuster stands 11' tall (compared to Hulk's 8'5"), but even done as eight pieces, the toy doesn't quite make that mark - depending on how you pose it, it stands about 9⅛". Despite being one of the biggest BAFs we've gotten from anybody in years, there really isn't a ton of detail in the sculpt. All the major elements are here - the multiple latches on the chest, the rotators in the joints, visible pistons, stuff like that - but there's a general smoothness that keeps this looking like a toy, rather than a scaled-down superhero. It's like they got the major shapes right, then called it a day. This would be fine, on the Titan Hero version, but aren't Marvel Legends aimed more at collectors? Snobby, stuck-up, highly entitled collectors with unreasonable expectations? Like us! Plus, some details are missing entirely, like the vents in his shoulder pads, or the fact that there are only two fingers on each hand instead of three. Maybe better paint would improve the look. The figure is mostly molded in red, which makes it look a little translucent and (by nature) plasticky. There are gold and silver details painted on, but not as many as there should be (especially on the back, which gets more paint than Ultron, but still not enough). They did paint the seven arc reactors it takes to run the suit - one in the chest, four on the back, and one on each knee - but didn't do anything for the repulsors on his shins and feet. Look, we realize that this is a mass-market toy, not a high-end specialty piece, but with Marvel Legends currently hovering around the $20 mark, we should be getting better than this. It will take a lot of customizing to bring these apps up to snuff. The articulation is good, with one exception. The armor has swivel/hinge rocker feet, swivel ankles, double-hinged knees, swivel thighs, balljointed hips, swivel/hinge wrists and elbows, swivel biceps, swivel/hinge shoulders, a hinged neck and a balljointed head. The bad point is the balljointed chest, which is just as problematic as we predicted: in order to be stiff enough to hold the two heavy halves of this massive figure in place, it's also too stiff to move easily; rather than just turning the torso like you normally would, you have to sort of rock it back and forth to "walk" it into position. That's annoying. 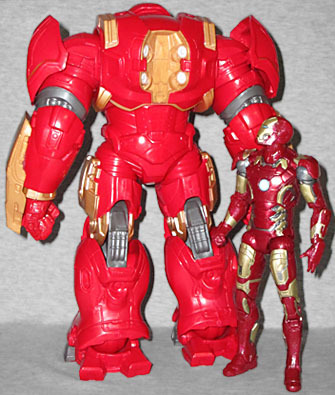 This Hulkbuster not only dwarfs the Iron Man 2 figure, it dwarfs the 616 version! It's far from perfect - with an incomplete sculpt, middle-of-the-road paint, and a chest joint that doesn't work perfectly - but it's like your grandma always says about your grandpa: size counts for a lot. This is a big impressive beast of a Build-A-Figure, the likes of which haven't been seen 'round these parts in quite a spell.